1Since its establishment, BELINA-ECO has invested in contemporary and high-performance industrial laundry equipment. This type of laundry requires high-tech assembly lines to meet the high requirements in this industry. The entire production process excludes all mistakes and poor quality work. For example, hotel linens are not subject to delay and accidental stains. As well as restaurant tablecloths. For the hotel industry, the quality of laundry, safe and reliable supplies are central to maintaining the optimal amount of bed linen. The continuous work cycle 24 hours, 7 days a week allows us to fulfill the supply commitments according to the needs and wishes of the customers. This organization is extremely important as it shortens the time for transmission and acceptance of production several times. This saves the precious time of hotel staff..
Our atelier have a professional laundry and professional ironing equipment – callander. Wet Cleaning is a professional cleaning technique that uses detergents and water. The dry cleaning ateliers in the 1930s and 1940s use wet cleaning for a quarter of all the clothes that arrive there. Wet cleaning was mostly used for natural fiber clothes, and the solvents for dry cleaning were used to clean the rest of the garments. The introduction of specialized non-flammable solvents in the 1950s allows dry cleaning of all types of fabrics, including natural fibers. As a result, wet cleaning is no longer necessary and dry cleaning is widely used. Driven by concerns about toxicity of solvents for dry cleaning, the modern achievement in wet cleaning technology and garment care revive wet cleaning while retaining the possibility of dry cleaning. The equipped ateliers are able to use wet cleaning for more clothes, which are usually for dry cleaning, as for silk, so for wool, flax, suede and leathers. Modern wet cleaning ateliers use specialized machines for the careful washing and drying of clothes. These machines can be programmed according to various variables such as: mechanical impact, water and drying temperature, humidity level in the dryer, quantity of the preparation. This flexible technology allows cleaning in a way that meets the specific needs of matter. 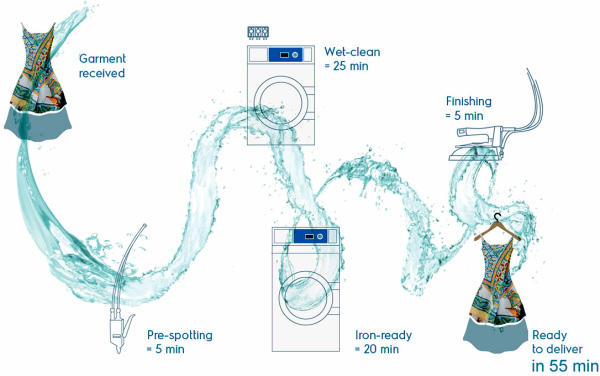 For example, machines can be set at less than 6 rotation per minute to reduce the mechanical performance of delicate fabrics during the wash cycle (as opposed to regular household washing machines that rotate the clothes at ten times as many rpm ). For safe cleaning of materials that can shrink when washed in water and drying, the centrifugal speed can be increased and so they will need minimal drying. Machines allow control of temperature and humidity levels during drying to prevent shrinkage. Wet cleaning ateliers also use other tools to ensure safe cleaning of clothes. For clothing that launches paint, a substance can be added to prevent painting other laundry clothes. New light bleaching agents can be used to remove stubborn stains without reducing the color of clothing. Softeners and enhancers can be added during wet cleaning to restore the softness of the fabrics, the shape and the freshness of the clothes once they are dried. 2For the needs of our customers we provide cleaning of carpets, rugs and blankets. The washing items (private or corporate) are processed only with a specialized modern washing machine for carpets from 30˚ to 40˚С depending on the fabric. Washing is done with special detergents. Our requirement is for tissues to be healthy so they do not break down after washing and drying. The preparations we use are certified according to all European requirements for ecology, antistatic, antibacterial, antiallergic. With high-quality detergents color fixation is achieved, avoiding the possibility of dyeing and fading of tissues. Drying is done in a specially-equipped room guaranteeing rising and combing of hairs. Before issuing, the products are combed, fragranced and packed in polyethylene foil to keep them in transport. The order is accepted by phone for the exact address from which can be received the carpets and an exact return address. It is necessary to specify the time of day when the person will be at the address. Taking carpets or other items is done within 24 hours of receiving the order. FREE TRANSPORT for Burgas. Orders accepted until 12:00 a.m., will be fulfilled on the same day. Requests accepted after 12:00 a.m. will be fulfilled the next day. Orders are not fulfill on Sundays! Pickup and delivery of carpets is done at the entrance of building. The service „upload to the front door“ charges 1 leva per item! The price for cleaning and drying is 2 leva per kilogram, due to the fact that items are washed in a machine rather than by hand. The clean carpets are aromatizing, brushing and wrapping in polyethylene foil, ensuring preserve purity in transport. Time to complete the service is up to 5 days from the pickup. We can also offer time up to 24 or 48 hours depending on the expressiveness of the customer’s needs. For more information please call us! Payment is made upon returning the address in cash against a receipt or invoice, or by bank transfer before delivery of the items. 4Since its establishment, BELINA EKO has been investing in modern and high-performance equipment for laundry of uniforms. This type of laundry requires highly specialized equipment to meet the high requirements in this branch. The entire production process excludes all mistakes and poor quality work. Our ateliers have a professional laundry and ironing equipment – a callander.